One of the weirder things about me is that I really enjoy cleaning. It de-stresses me and the end result of getting to kick back and relax in a clean home is just so satisfying for me. It all started because my mom has implemented the importance of cleaning since I was literally a child (typical Polish household problems). Growing up I noticed my mom using a lot of the products at home I'll be mentioning today in this post. I knew that when I had my own place I would be purchasing some of those products as well. Being a huge animal lover, nothing makes me happier than supporting brands/companies that do not test on animals. These products I've been using in my home are cruelty-free and non toxic. Two brands I've been picking up are Method and Mrs. Meyers, both of those brands I usually pick up from Target. Mrs. Meyers products are made with mostly naturally-derived ingredients and essential oils. They smell very natural but in a good way! 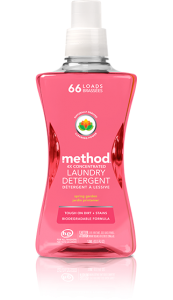 Method on the other hand has so many different scents which I absolutely love and their assortment of products is pretty wide. They carry dish soap, hand soap, laundry detergent, floor cleaner, you get the point right? And trust me the scents are amazing, but most importantly no animals are harmed in the process!! I personally really love using these products in our home and would love any recommendations you guys might have for other natural companies you think I should try!